kirk weisler | Mzsunflower's Say What? 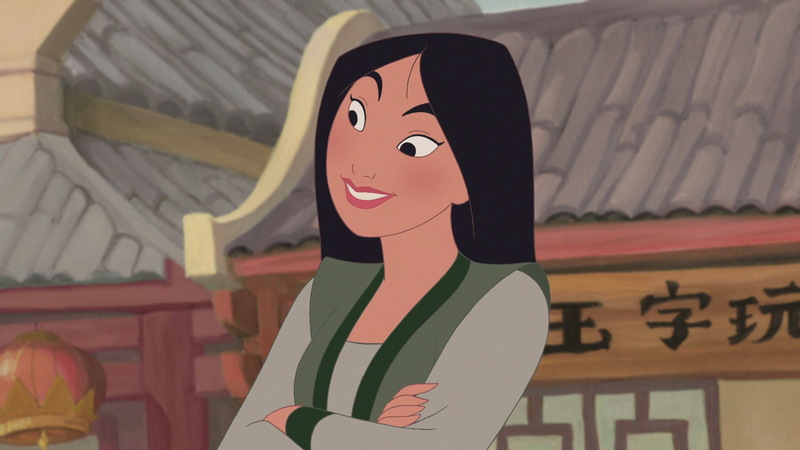 Go ahead and cross your arms. It can make you look standoffish – but it can also help you figure out solutions to problems. That’s because crossing your arms engages both sides of the brain – the logical left and creative right. And research shows that crossing our arms makes us more likely to stay focused during a difficult task. 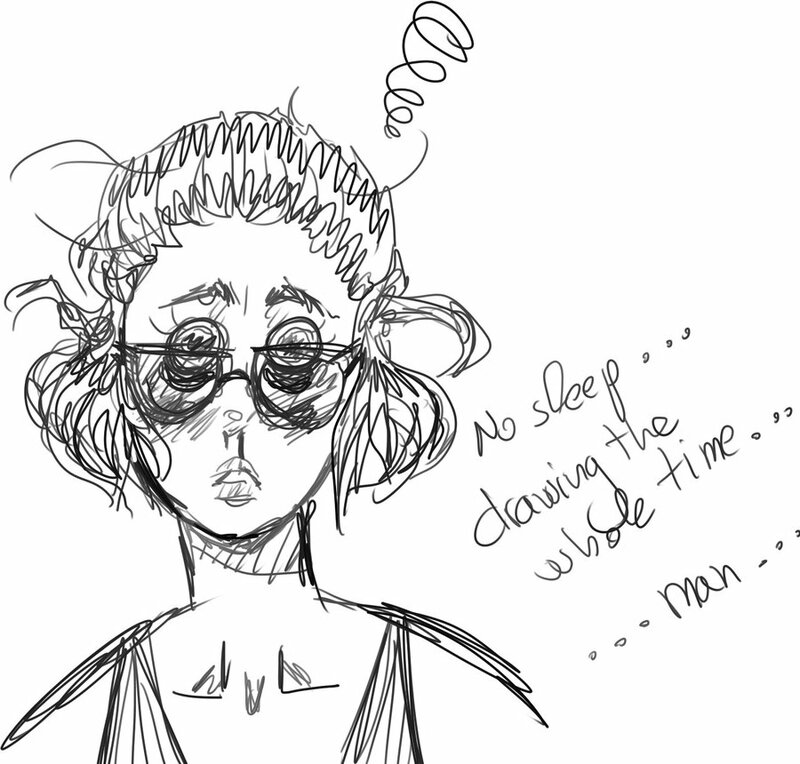 One of the most common causes of insomnia is…worrying about insomnia! In other words, when you’re afraid you’ll be a zombie tomorrow if you don’t fall asleep, it pretty much guarantees you won’t fall asleep. What can you do? Simply remind yourself that you can survive with only a little sleep. It may not be ideal, but you can do it. …and that mental reminder might be enough to help you relax and actually get some ZZZ’s. When Rebekka Garvison boarded her Spirit Air flight from Chicago to Atlanta earlier this week with an infant in tow, she saw the annoyed looks of her seatmates. When baby Rylee started crying before takeoff, the situation with her in-flight neighbors didn’t improve. “As soon as we got on the plane at 5:30 a.m. it was very quiet and it was a full flight,” Garvison wrote in a Facebook post that’s now been shared almost 85,000 times. Garvison asked if she could change seats. That, and her new seatmate, made all the difference in the day of this young mom from Kalamazoo, Michigan, who was on a trip to surprise her military husband. “She [Miller] was such a relief and so calming to me. I was already stressed and then seeing everyone else’s faces, that just made it even worse.” Garvison said she and Miller are in close contact. Cherish Sherry – “Must watch!! After I came back from badminton I open the garage door try to drive my car in and heard Tiana voice yelling “stopped mama”!! My shoe rack has fallen down in the garage all over. 50 pairs of shoes and the rack are on the ground. I was stunned by it! She is teaching me!! At an age where chaos is a trend, our chances of seeing people helping each other have become so rare. But, this doesn’t mean that they are nonexistent. Random acts of kindness may be scarce, but they never fail to amaze us. Here are photos and stories of people helping the elderly. A volunteer teen gives a gift to a bed-ridden lady. Elizabeth Reed, 13, was among volunteers who delivered Christmas in June bags to hospice patients in Alabama, USA. Here, she visits Nola White, who can no longer speak or care for herself because of colon cancer. Together with her was White’s daughter,Janice Hornbuckle. A grocery store employee ties the shoelace of an old shopper. A kind-hearted employee at a Florida grocery store won over the hearts of thousands online after recently going out of his way to help an elderly shopper. 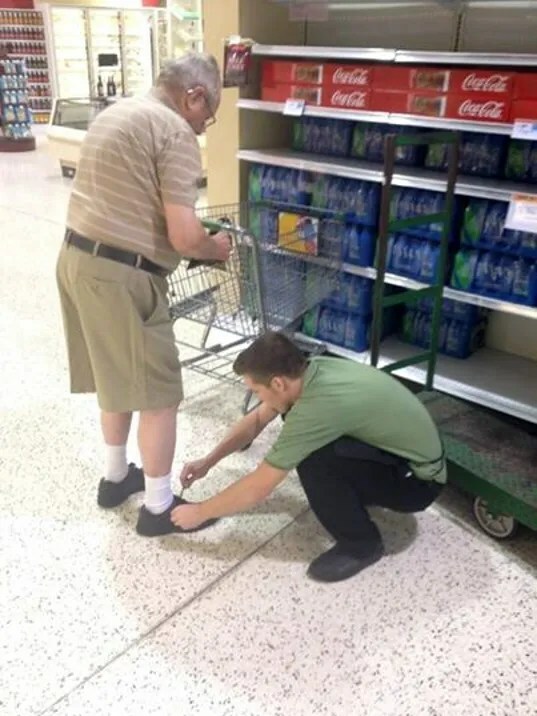 The adorable and heartwarming incident happened at a Publix store in Ormond Beach, when an employee named Gage generously got down and tied the shoelace of an older man who was doing his weekly shopping. Gage’s random act of kindness was spotted by another shopper, Keith Kiel, who captured the moment and was so impressed that he posted it on the store’s Facebook page as a tribute to the young man’s kindness. A young volunteer tries to make an old lady smile. A young volunteer makes an elderly lady smile, while visiting her at a home for the aged in Ecuador. A young dude helps a woman cross the street. 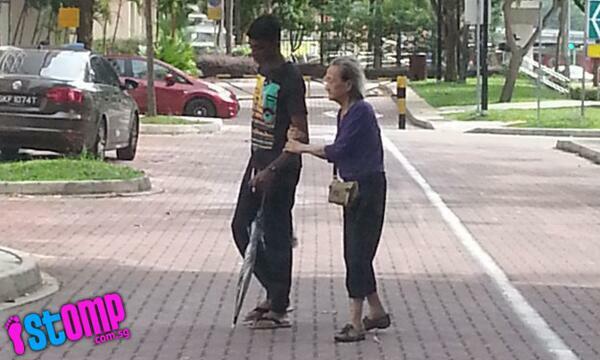 A young man was spotted helping an elderly lady cross the road at Bukit Panjang in Singapore. This guy offers his back for an old lady to sit on. A young man named Cesar Larios turned himself into a human chair to help an elderly woman, after the two were trapped in an elevator for over an hour. When the elevator stopped moving, Larios generously allowed the 79-year old elderly woman named Rita Young to use his back as a chair because she wasn’t able to stand for too long. He promised the woman that he was there for her and that he was going to take care of her, so she would not panic or be afraid. Larios says he “felt like it was the right thing to do”. An image showing Rita sitting on Larios’ back had since gone viral. This man stops what he’s doing to help an elderly man. An employee at a pizza joint in East Cobb, Georgia, was at work one day when he looked out the front window and saw an elderly man struggling to cross the street . The young man dropped what he was doing and ran to his aid. Someone around caught it on tape, and the clip has gone viral for all the right reasons. You can watch the whole thing below, and try to keep off the waterworks. A fast-food restaurant employee walks an old woman back to her car. A Tennessee teen, who works at a fast-food restaurant, became a social media hit after he was caught on camera helping an older woman back to her car. Kailen Young, 17, was cleaning windows at Hardee’s when he carried out his gesture of kindness. When he spotted Bobbi Clare, a frail elderly lady using a cane, Young stopped what he was doing, took her by the hand, and led her safely to her car. The selfless gesture was captured in a photo by another customer, David Yardley. He posted the picture on Hardee’s Facebook page, where it has been “liked” more than 17,000 times. Young has even received praise from across the globe for his lovely gesture. One Facebook user, Yerri Guy, wrote, “Shared all the way in Australia! Tell this young man he is a hero! In this world of so much negativity, it is uplifting to see that we haven’t lost touch with humanity! Here’s hoping that someone in Hardee’s head office sees this pic, and this young man is rewarded for his amazing representation of this company!” And, that is exactly what happened. An Everton fan helps an old Liverpool fan. 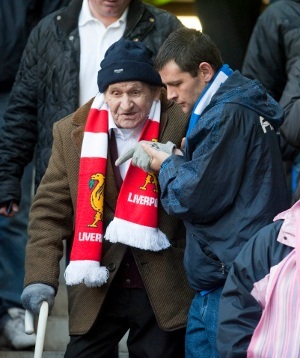 A young Everton fan helps an elderly Liverpool fan down the steps of a Merseyside Derby. A guy took an old woman back to her car under the pouring rain. 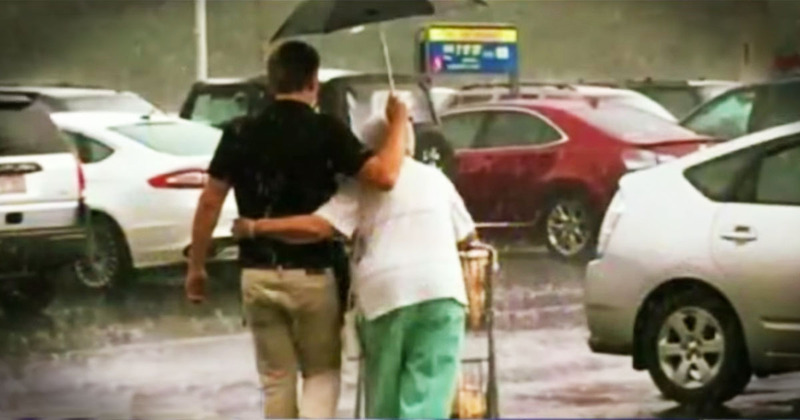 A young bagger at a North Carolina grocery store was caught on camera helping an older woman to her car in the pouring rain. Now it’s going viral. But, the random act of kindness didn’t keep Aaron dry. As soon as she got into her car, the umbrella flipped inside out, leaving him soaking wet. He returned to the store, drenched, but was greeted with applause from other customers. Cousins helps an old lady they spotted on the street. 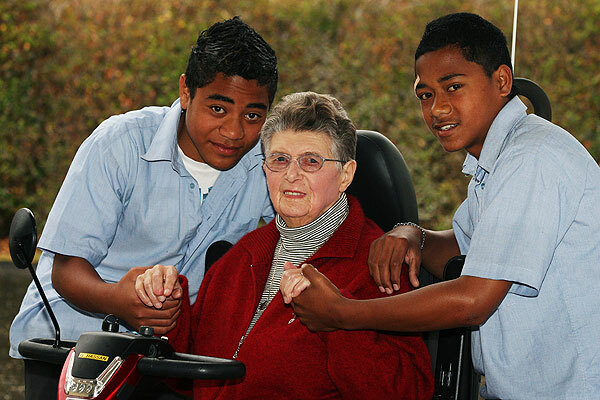 An 87-year-old woman is calling two teens heroes for coming to her rescue after the mobility scooter she was riding slipped off the side of the footpath and landed on top of her. Gloria Hassan said she was heading back to her room at Bethsaida Retirement Village in Litchfield Street after visiting her husband, who lives round the corner on Weld Street in another part of the village when it happened. The wheel of her scooter slipped off the side of the footpath. She was thrown from the scooter, as the machine rolled and eventually landed on top of her. “Not a soul was about,” she said. She could not get up on her own and was lying on the grass for what seemed to be about half an hour before cousins Tevita Kaloni, 14, and Petelo Kaloni, 13, discovered her on their way home from Marlborough Boys’ College. Petelo said he and Tevita did not think twice about helping the elderly woman. Mrs. Hassan, who has artificial knee and hips joints, thankfully was not injured in the fall. Mrs. Hassan was so thankful she wrote a letter of excellence to Marlborough Boys’ College principal, Wayne Hegarty, and gave them each a $5 reward. When The Marlborough Express spoke to Petelo’s mother, she said he did not tell her about the incident. “It’s like a thousand dollars to me that they would do something like that,” she said. Mrs. Hassan’s husband, Lawrie, said the two young men did a spectacular job. A motorcyclist risks his safety to help a blind man cross the street. 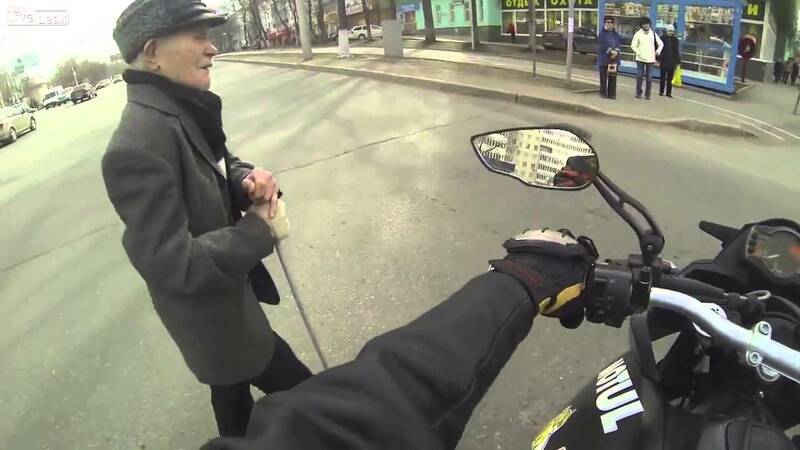 A motorcyclist with a helmet camera saw an elderly blind man trying to cross the street. He noticed that the man didn’t seem to realize the danger he was in. So, he risked his own safety, and the anger of other motorists and zoomed over to help the elderly man. He positioned himself between the man and the oncoming traffic, so that the old man could cross the road safely. 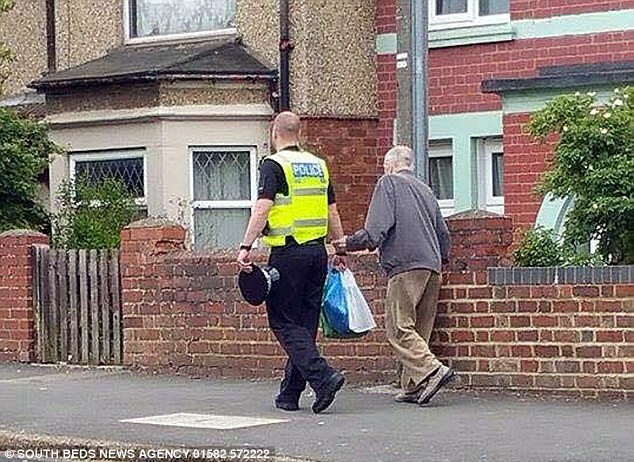 A police officer helps an old man carry his shopping bags home. This heart-warming picture of a police officer helping an elderly man went viral. PC Chris Stevens saw the elderly man and assisted him with his heavy bags in Kingsthorpe, Northamptonshire. The elderly man had ridden the wrong bus and was faced with a long walk home. The Northamptonshire Police posted the image, taken by a passer-by, on their Facebook page and it quickly spread. PC Stevens says any of his colleagues would have done the same thing. He also complimented the man he assisted saying, “ultimately though the most recognition needs to go to the lovely man who despite being 83-years-old manages to catch the bus into town and bring his shopping home to his wife”. These are the three Americans who stopped what probably would have been a massacre on board a train in France. I can’t even begin to say how impressed I am by what they did. They didn’t stop and think about what was happening. They easily could have been killed. Instead they captured the gunman. And potentially saved everyone on board that train. Spencer Stone, Alek Skarlatos and Anthony Sadler. They make me proud to be an American. Exercise isn’t just about burning calories and building strength. It’s also about improving productivity and quality of life. But when is the best time to exercise? The answer is whenever it best fits into your schedule. One problem with afternoon or evening workouts is that they are often put off by other conflicting responsibilities. In addition, if you exercise too late in the day, it can be hard to “wind down” and fall asleep. Early morning can be a great time to get some exercise in as long as it doesn’t make you late for the rest of your day. As a spine surgeon I have to be “ready to go” with a high energy level by 6 a.m. This doesn’t leave time for a lengthy morning workout so we at MDFitness came up with a 5-minute workout that you can do right out of bed without disrupting your morning routine. In the time it takes to brew your coffee you can have your metabolism revved up to full throttle and ready for whatever the day throws at you. It works for me and I know it will work for you. We use the same easy-to-follow exercises you will find in our DVD The Doctors Workout. It’s the equivalent of adding an espresso shot to your coffee. You will jump-start your metabolism for at least an hour following the exercise. You will improve your productivity and mental function for several hours. You will have more energy and a feeling of happiness through the release of endorphins. You will help control your appetite during the rest of the day, promoting weight loss. You will see a direct benefit to your heart health. You will be more consistent with your workout as you will have fewer scheduling conflicts. We will begin with jogging in place. This is a great way to start our warm-up. While you are getting the cob-webs out of your head your arms and legs are starting to get more blood flowing. We are also lubricating all the major joints so they won’t stiffen up later. You should feel your heart rate starting to come up and your breathing start to quicken. Keep your arms nice and relaxed and stay on the balls of your feet. Start by raising up one leg while rounding the back and reaching forward bringing the arms together. Now repeat the move on the other side. If you can touch your foot, that’s great. If not, just raise the leg as much as feels comfortable. 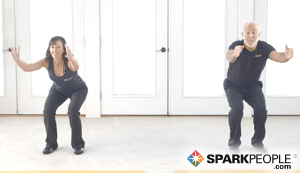 This exercise is dynamically stretching the hamstrings and back muscles at the same time. It is what we call a compound exercise that works several muscle groups at once. We are going to rev things up now with high knees. This move will really get your heart pounding. If you are just starting to exercise do the move like a march rather than a hop. As you progress you can start to bring the foot off the ground as you go from side to side. Leg exercises like this are great for boosting the metabolism. The leg muscles are much bigger than the arm muscles so they generate more energy and heat. Next we will move on to leg squats with forward arm raise. With your feet hip-width apart and toes pointing forward, bend the hips and knees like you are sitting down while raising both arms up to shoulder height. In the beginning you may want to go part way down but as you advance you will be able to squat to a full 90 degrees. This is another super compound exercise that works the shoulders, hips, knees, and ankles all at the same time. Pretend you have a jump rope in your hands and try to coordinate your arms and legs to mimic the motion you would use with the rope. Stay on the balls of your feet with the knees slightly bent. Beginners can start at a slower pace and speed up as they improve their strength and endurance. This is one of the best lower-impact cardio exercises, but you can increase the challenge and impact by moving into a bigger jump. Begin by stepping forward with the right foot, then bending both knees while keeping your weight over the back knee. Come back up and alternate sides. Try not to touch the floor or mat with the back knee. As in all of these exercises, you can adapt the move to your fitness level or flexibility. Whether you go part way or all the way down your quads and hamstrings are still working hard. This will keep the heart rate up, too. Like the name implies, we are hopping sideways back and forth from leg to leg while swinging the arms mimicking the motion of skating. Beginners should step from side to side while more advanced exercisers should hop or jump. The hips and knees should remain slightly bent. This keeps the muscles under tension and increases the value of the exercise. Muscle tone and balance are important benefits from skaters. Begin lying on your back with both hips and knees flexed 90 degrees. Keep your hands lightly on the sides of your head while lifting the head and shoulder blades slightly off the floor. Extend one leg out while bringing the opposite knee in toward your shoulder, twisting toward that knee with your upper body. Continuously alternate sides. The bicycle crunch has been scientifically proven to be the best ab exercise there is! Now roll over for everyone’s favorite exercise: push-ups. Beginners should keep the knees on the mat. Try to do between 12 and 15 repetitions if you can. As you can see, this exercise requires a fair amount of upper body strength. If you can’t do the full 15, just do as many as you can. If you can’t go all the way down then just go part way. Remember, the exercises we hate the most often do us the most good! Back on your feet for the final exercise, which needs no explanation as everyone has seen or done it at some time in his or her life. It’s a fantastic compound exercise working the shoulders and hips. It targets the inner and out thigh muscles, which are hard to strengthen. Congratulations! You have just Jump started your metabolism. As you start to cool down and get ready for you day, the health effects of the program will continue for hours. Remember, this should not prevent you from doing your regular exercise program. It is just an added bonus. Don’t forget to check out “The Doctors Workout” DVD for more ideas. Starting a workout routine is always difficult. Staying with it is equally challenging. At MDFitness we firmly believe that there is a benefit to any exercise program no matter how short. Try this easy-to-follow 5-minute routine and you will feel amazing. As you start to see the fantastic results you may want to think about adding a longer workout to your schedule 3-4 times a week. Hero of the day: Jamie Harrington! 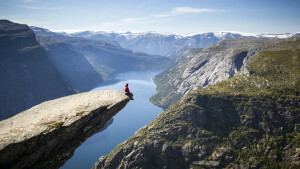 “I was just on my way to the shop when I saw this guy in his 30s sitting on the ledge of the bridge. I just thought, “wow…” I stopped and asked him if he was okay, but I knew from the look in his eyes he wasn’t, and he didn’t say anything either, but I saw tears coming from his eyes. I couldn’t leave him there alone, but I had to go, so I called an ambulance. I told him I wouldn’t sleep knowing he was just walking around alone. So I rang it, and he was taken to St. James Hospital.